Welcome. This badge is our badge. 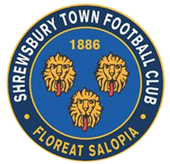 On the morning of 27 March 2007, Shrewsbury Town Football Club officially unveiled its new badge. 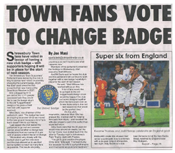 “New logo confirmed” read the headline of an article on the club’s website, in which former Chief Executive Steve Wellbeloved waxed lyrical about the “clear, strong and clean” badge produced by local graphic designer Tony Brooks. Despite Wellbeloved’s rhetoric, the new logo amounted to little more than a yellow, cartoon-style lion encircled atop a light blue background. A real abomination. However, this was just the beginning. A couple of minutes later, there was a shocking discovery. It was revealed that the club – having shamelessly boasted of its professionalism and adherence to “expert legal advice” – had introduced a new logo featuring a lion pinched from an online clip art collection. See for yourselves! The infamous “clip art lion” moniker was born, and a football club with a proud history would now be represented by a piece of commercialised tat. Many supporters reacted to this unbelievable development with obvious disdain: “amateurish”, “shockingly bad”, “cringeworthy” and “the biggest blag since Kevin Ratcliffe” were amongst the fitting descriptions used. In recognising perhaps the most significant comment made on this fateful day, we must once again return to the press release published by the STFC media department. 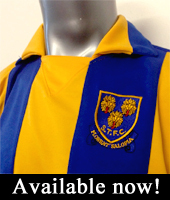 Having waffled on about the club’s need to “protect its brand” by adopting a “gloves off” approach to those producing knock-off merchandise, Steve Wellbeloved confidently predicted that disillusioned Town fans would soon find themselves “attached” to the new badge within just a few seasons. Wellbeloved was wrong. 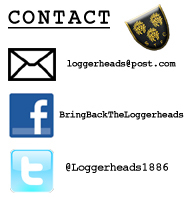 Formed in the summer of 2012, the Bring Back The Loggerheads campaign advocates the return of the Loggerheads; three leopard heads which represent the town of Shrewsbury and our wonderful football club. It is high time they returned to our shirts. Loggerheads forever, clip art never. This entry was posted on Sunday, August 18th, 2013 at 7:00 AM and is filed under Uncategorized. You can follow any responses to this entry through the RSS 2.0 feed. Responses are currently closed, but you can trackback from your own site.